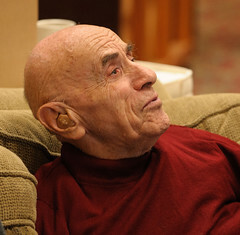 Felix Fibich, our long time neighbor, passed away on March 20, 2014, at the age of 96. His long-time companion Jay is receiving visitors (if you call first) for the Jewish mourning ceremony known as "shiva" until Monday evening. Felix was a choreographer and dancer all his life - as well as an actor (in Law & Order, among other productions). In a well-known Super Bowl half-time ad, he was seen teaching a football team to float like butterflies. See the NY Times obituary. Until his last years, he was always cheerful, always optimistic. Having survived the Nazis with his beloved (late) wife, and making a living in his chosen field, he was happy with the community he formed in his adopted country.